Water content determination generally takes 16 to 24 hours by oven drying method. To quickly determine the water content at site, use of Rapid Moisture Meter is very advantageous. In this method, water content is determined from the gas pressure developed by the reaction of calcium carbide (Absorbent) with free water of the soil sample. 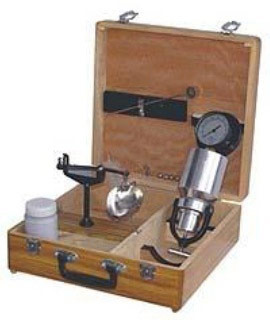 From the calibrated scale of the pressure gauge, the percentage of water on total (wet) mass of soil sample is obtained and the same is converted to water content on dry mass of soil. A. Metallic pressure vessel, with a clamp for sealing the cup, along with a Pressure gauge calibrated in percentage water content as per IS-12175:1987. B. Counterpoised balance, for weighing the sample. IS-2720 (Part 2):1973 (Reaffirmed- May 2015) “Methods of test for soils: Determination of water content (second revision)”. Preparation of Soil Sample: Sand requires no special preparation. Coarse powders may be ground and pulverized. Cohesive and plastic soil is tested with addition of steel balls in the pressure vessels. The test requires about 6 grams of soil sample. Set up the balance, place the soil sample in the pan till the mark matches with the index mark. Unclamp the clamping screw of the instrument sufficiently to move the U-clamp off the cup. Lift off the cup. Check that cup and body are clean; otherwise clean it using a brush. Hold the Moisture Meter horizontally and gently deposit the one level scoop-full of the absorbent (Calcium Carbide) inside the chamber. Transfer the weighed soil from the pan to the cup. Holding cup and chamber horizontally, bringing them together without disturbing the sample and the absorbent. Clamp the cup tightly into place. In the case of clayey soils and pastes, place the 3 smaller steel balls in the cup along with the sample and larger one in the body along with the absorbent. Shake the moisture meter up and down vigorously for 5 seconds, then quickly turn it so that the gauge is upwards, give a tap to the body of the moisture meter to ensure that all the contents fall into the cup. Hold the rapid moisture meter downwards, again shake for 5 seconds, then turn it with gauge upwards and tap. Hold for one minute. Repeat this for a third time. Once more invert the rapid moisture meter and shake up and down to cool the gas. Turn the rapid moisture meter with the gauge upwards and dial horizontal held at chest height. When the needle comes to rest, take the reading. The readings on the meter are the percentages of water on the wet mass basis. For other than Clayey soils, place the 3 smaller balls in the cup along with the soil and the larger one in the body along with the absorbent and seal up the unit as usual. Hold the rapid moisture meter vertical so that the material in the cup fall into the body. Now holding the unit horizontal rotate it for 10 seconds so that the balls are rolled round the inside circumference of the body. Rest for 20 seconds. Repeat the rotation-rest cycle until the gauge reading is constant (Usually this takes 4 to 8 minutes). Note the reading as usual. Finally release the pressure slowly (away from the operator) by opening the clamp screw and taking the cup out, empty the contents and clean the instrument with a brush. The natural moisture content of the soil sample is ________ %. The result should be reported to two significant figures. The absorbent is highly susceptible to absorption of moisture and so shall not be exposed to atmosphere; as a result the absorbent suffers deterioration and will give results to the lower side. Replace the lid of the absorbent container firmly as soon as the required amount of the absorbent for a test is taken from the bottle. The absorbent suffers deterioration with time.